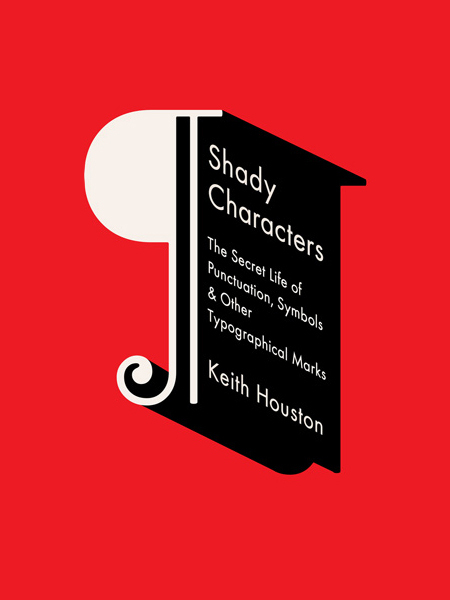 Keith Houston’s 2013 book Shady Characters: The Secret Life of Punctuation, Symbols, and Other Typographical Marks is like catnip for word nerds. It’s rife with historical trivia about the more uncommon punctuation marks that have littered language history, including the pilcrow (¶), dagger (†), and interrobang (‽). It also provides background on the symbols we seen all the time, like the hash sign (#) or the ampersand (@). Intrigued? Of course you are! Learn more at shadycharacters.co.uk and read on for some notes I took while reading the book. Caution: extreme geekery ahead. — The word pilcrow originated as the Greek paragraphos, which became pelagraphe, which became pelagreffe, whose Middle English pylcrafte turned into pilcrow.